A single Klip can use multiple data sources, providing greater flexibility in the type and amount of data displayed. To create a data source, see creating data sources. At the bottom of the Data panel, click + Add Data Source. 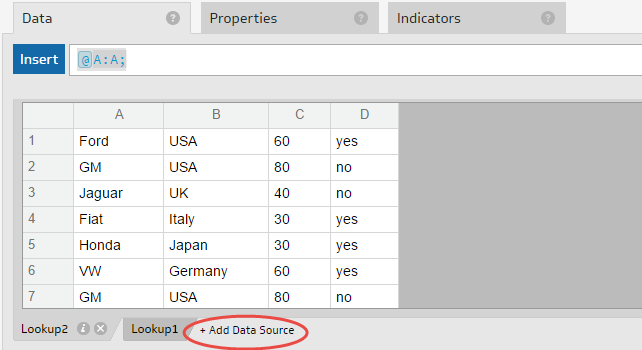 Select a data source from the list of existing data sources. You now have an additional data source in the Data panel. To access an additional data source, click on its tab. Tabs turn light grey when selected. To assign new data to an existing formula, re-point formula references to the new data source. In the type-in formula bar, select the column or row reference that you want to add new data to. For example, A:A. Select the tab of your second data source (a darker tab). Within the second data source, select the actual column or row you would like to reference. Data from your second source is assigned to your existing formula and Klip. To build a brand new formula with multiple data sources, use the ARRAY and LOOKUP functions. For more information, see Segmenting multiple data sources by rows in Managing the size of your data sources.